Black sweater with matching buttons and orange trim and pocket welt. We have been making varsity sweaters since 1946, and have continued to manufacture them using the same meticulous quality year after year. One of the oldest and last manufacturers to continue the letter sweater tradition, we make sweaters the old-fashioned way: from 100% virgin wool, one at time, customized to your design. Letter sweaters are a great way to stand out from the crowd, honor a tradition, and add a retro spin to your award letter. sturdy 100% virgin wool with two front pockets and stripes on one sleeve. custom knit to your own individual specifications, colors and measurements. personalized to your design with chenille emblems, choice of colors, striping and school awards. available made-to-order in any quantity, for individuals, teams, schools, or companies. Scarlet red virgin wool sweater with award letter. We give special attention to details that make TM Athletics sweaters the best in award apparel. They are custom knit to your individual requirements for body color and sleeve striping, with adjustments to sleeve and body length for a perfect fit at no extra charge! See Sweater Sizes for a detailed sizing chart to perfectly tailor your fit. Prices start at $125 (see Price List for details). For information on how to get your own customized, made-to-order letter sweater, contact us today. You get to choose the size, cuffs, striping and even the pocket lining. 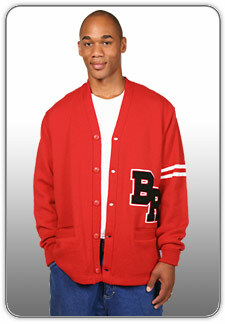 A fun, lightweight alternative to letter jackets with a cool retro look. © 2007–2015 TM Athletics Inc. All Rights reserved. TM ATHLETICS ® is the Federally Registered Trademark of TM Athletics Inc.